Pansy Beaconsfield - Brad's Bedding Plants, Inc.
Pansies are the cold weather plant of choice for late fall, winter and early spring color. They are exceptionally hardy and will thrive in the cool southern winter months. 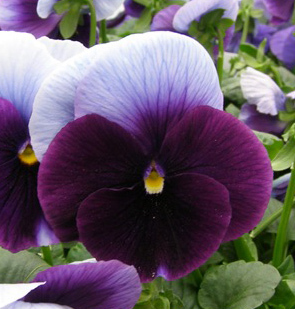 These pansies have large, thick petaled, 3-5 inches flowers. Matrix makes high-impact landscapes containers with more flowers per plant in landscapes and containers. Frost tolerant and low maintenance. Grows up to 8” in height and 8-10 in width. Requires sun to partial shade.